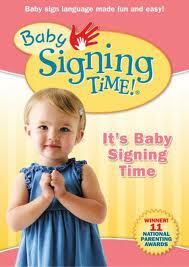 I don't love that my kiddo likes TV and movies as much as he does, but Baby Signing Time! is a great way to incorporate learning, interactive time and a little screen time. I was given a DVD of Baby Signing Time volume 1 bundle to test out, and my guy just LOVES the DVD. It's super kid friendly, engaging and educational! What more could a working mama want!? I also get the chance to interact with him and the DVD and practice when the screen is turned off! He loves showing off his signs, even though he can talk well, too. We have a few babies at church who are learning signing, and they are signing with my 3 year old! Its SUPER and when his baby brother arrives in a few short weeks, we will have even more fun with the Baby Signing Times DVD and activities.